Its tasty but what is it? First, a disclaimer. I’m going to be discussing traditional pumpernickel bread. The kind pictured to the right is almost certainly modern pumpernickel which gets its color from dark substances like molasses or cocoa powder, and often is made with wheat flower rather than the traditional rye. But that’s a boring story. This one is more exciting! 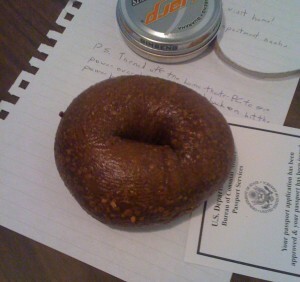 Pumpernickel is a form of slowly cooked rye bread first created in parts of present day germany. The bread would cook at low temperatures for up to a full day. By the end of the baking, a chemical process called the Maillard reaction has taken place which generatedboth the darker color and one component of the characteristic pumpernickel taste. The simplest (though it’s probably not perfectly accurate) way to think of pumpernickel bread is that the long cooking darkens the whole loaf the way toasting (without burning) can darken a single slice. The end result was a weed that was even more difficult for farmers to control, but also one with larger seeds that was already adapted to the lifestyle of an agricultural crop. Which would all just be an obscure, if interesting, bit of agricultural ecology if it weren’t for the fact that rye is in many ways a tougher, hardier, plant than wheat. 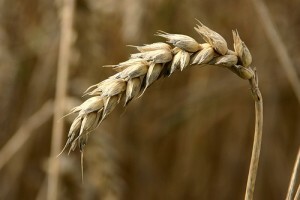 Farmers could grow rye where wheat would fall, feed children who would otherwise starve. The plant biologist’s perspective on pumpernickel: a little chemistry and a lot of crop domestication. From the label of a German-style pumpernickel sold by Trader Joe’s in eastern Massachusetts. *If you’ve read Jarad Diamond’s Guns, Germs, and Steel, one of the points he makes is the the middle east (the origin of wheat, barley, rye, and oats) was much richer in potentially domesticable grain species than other parts of the world as agriculture was first emerging. **Yup, the same Vavilov I’ve been talking about this week, but this article was inspired by a pumpernickel bagel, not the book on him I was reading. Vavilovian mimicry describes a weed that has evolved to look more like a crop species. Vavilovian mimicry is an adaptive response to hand weeding as herbicide resistance is to chemical control of weeds. ***Since I’m a maize geneticist at heart I also have to point out that some kinds of teosinte have been evolved to look much more like domesticated corn in areas of mexico where teosinte grows as a weed in cultivated corn fields and intensive hand weeding is still practiced. It’s not as clean an example of vavilovian mimicry though, because maize and teosinte can mate to produce fertile offspring, so genes can flow between the two populations, unlike wheat and rye. ****Of course now traditional pumpernickel bread (the kind made with solely rye flour) will often be paired with foods like caviar and smoked salmon (or at least so wikipedia tells me). Posted in: Crop Profiles, food, Plants. This is very cool. I had never heard of Vavilovian mimicry before. Neither had I until I started looking into the history of rye, now I’m fascinated but I don’t think I can read any more the the subject without biking into work where I have access to paid scientific journals. Cool interesting post; I learned a lot. I wonder where I could find some traditional pump. bread? Interesting argument; any chance of some references to the probably domestication of rye (other than Wikipedia) that lead you to this view? The origin of the theory (as far as I am able to tell) was a 1917 paper by Vavilov called “On the origin of cultivated rye”. The latest review I found on the subject (I couldn’t get at the original paper), was also named On the Origin of Cultivated Rye by H A Spencer and J G Hawks link but that came out in 1980, so I’d be happy to put out a correction/retraction if you know of more recent data that argues against or flat out disproves this origin for rye.